his is a short story by Ursula K. Le Guin printed letterpress on white linen paper made by Le Papeterie Saint-Armand paper mill in Montreal, Canada. The book is sewn into Saint-Armand�s Green Umbrella cover paper. 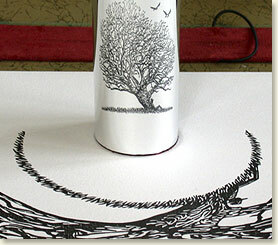 The original anamorphic woodcut by Aaron Johnson is presented as part of the portfolio box which also houses the cylindrical mirror with which to view the print. Anamorphic art is first recorded in the west by Leonardo da Vinci in 1485 in a drawing in his Codex Atlanticus. 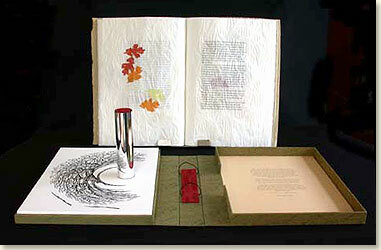 The book, print and mirror are housed in a cloth covered portfolio box covered in green Japanese cloth. 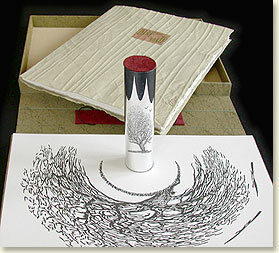 The edition is limited to 150 num­ber­ed cop­ies, (120 for sale) and is signed by Ursula K. Le Guin and Aaron Johnson. the illusion of growing larger as the walker approaches, and then diminishing as the walker recedes, but as there is more traffic and as the traffic speeds faster to its destination, the tree must grow and then shrink for many sets of eyes, some of whom are in such a hurry that they barely notice the tree working so hard. The linen paper rustles as you turn the leaves, and the original anamorphic woodcut shows the tree in its reflection, giving the reader time to reflect on their own perception of their surroundings.